Doug is a 1995 graduate of the University of Akron Law School and licensed to practice law in Pennsylvania, The United States Supreme Court, Middle District of Pennsylvania and The Third Circuit Court of Appeals. In 2007 Doug’s family was approached to lease their Wayne County property and Doug took on the task of negotiating this large lease along with many neighboring properties totaling approximately 2,000 acres. Mostly through word of mouth, other Landowners began to reach out to Doug for assistance and experience in negotiating gas lease offers. Doug found his calling and quickly made the decision to focus his practice on representing Landowners, and only Landowners, in negotiating all contracts related to Marcellus Shale and natural gas development in Pennsylvania. Doug has negotiated Oil and Gas Leases for hundreds upon hundreds of Landowners and has negotiated pipeline agreements with our 40 separate companies across Pennsylvania. Doug has also represented Landowners across Pennsylvania in negotiating Surface Use Agreements, Roadway Agreements, Meter Site Agreements, Compressor Station Agreements, Water Impoundment Agreements and many other contracts and matters related to natural gas development. Doug’s oil and gas practice expanded rapidly and continues to grow today to include all oil and gas related contracts, royalty issues and disputes, estate planning, and so much more. 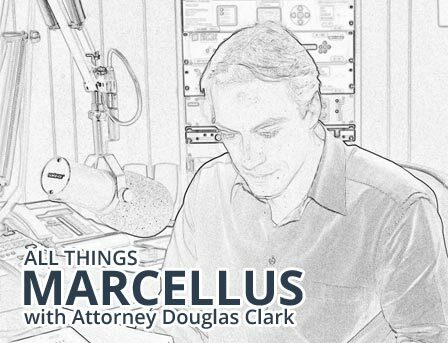 In August of 2010 Doug began hosting his Landowner informational radio program, “All Things Marcellus”. Doug has recorded over 175 hours of programming which are indexed by topic and archived at: PAGASLEASEATTORNEY.COM. Doug has a unique attorney background being raised adjacent to his grandparents’ farm in Armstrong County Pennsylvania where he worked during the summers spent with his grandfather. Through generations of family farmers and steel workers, Doug developed a deep appreciation and respect for the land and the importance of property ownership. Doug has an absolute commitment to Landowners and takes enormous pride in the work he has done on behalf Pennsylvania landowners. Doug Clark has been featured on the cover of the National Law Journal and has been interviewed by numerous news organizations for his knowledge regarding Pennsylvania oil and gas law and his work relating to Landowner representation. He was also featured on WVIA’s Business Journal television program regarding his Landowner representation and personal story of growing up in rural western Pennsylvania. To learn more about Doug, his history, and work with Landowners you can view the entire Business Journal interview at PAGASLEASEATTORNEY.COM. Doug is married to Marceea Clark, who manages and runs The Clark Law Firm, P.C., and they reside in Peckville with their two teenage sons. Southwestern Energy contacted us in 2014 regarding leasing three parcels that we own in Susquehanna County, PA. Since the deeds were each recorded in various names/entities, it was a lot more complicated than most transactions. The original 2008 lease with a different company had expired prior to any drilling operations taking place. By this time, the “competition” amongst numerous companies had ended within our area; which of course meant not having options or leverage to negotiate a new lease. Naturally, this made us wonder what kind of contract we could get. We received the proposed new lease and presented it to an attorney who we had previously used for some real estate business years ago. He made some suggestions and added his recommended requests and we returned it to Southwestern. All of those changes were denied. We then contacted Doug Clark who has done numerous leases with Southwestern. He first informed us about the items he would request and which ones he felt he could get; as well as a couple he thought he wouldn’t. After numerous efficient and helpful conference calls and his persistence, we obtained exactly what he had hoped for and even a little more. Doug and Marceea Clark, along with their entire team, were always available whenever I contacted them. They were extremely pleasant and very respectful. In my opinion there is way too much to learn and too much to lose by trying to “go it alone”. My wife and I would highly recommend The Clark Law Firm for any dealings regarding gas or oil leases.